2Dipartimento di Fisica e Chimica, Università di Palermo, Italy. Entanglement for distinguishable particles is well established from a conceptual point of view with standard tools capable to identify and quantify it [1, 2]. This is instead not the case for identical particles, bosons (e.g., photons, atoms) and fermions (e.g., electrons), where particle identity may give place to fictitious contributions to entanglement which has been the origin of a long-standing debate [2-4]. For all practical purposes, when two identical particles are spatially separated, as in experiments with photons in different optical modes or with strongly repelling trapped ions, no ambiguity is possible for which particle has a given property so they can be effectively treated as distinguishable objects : in this case, no physical contribution to entanglement arises due to indistinguishability. Figure 1: Asymmetric double-well configuration. 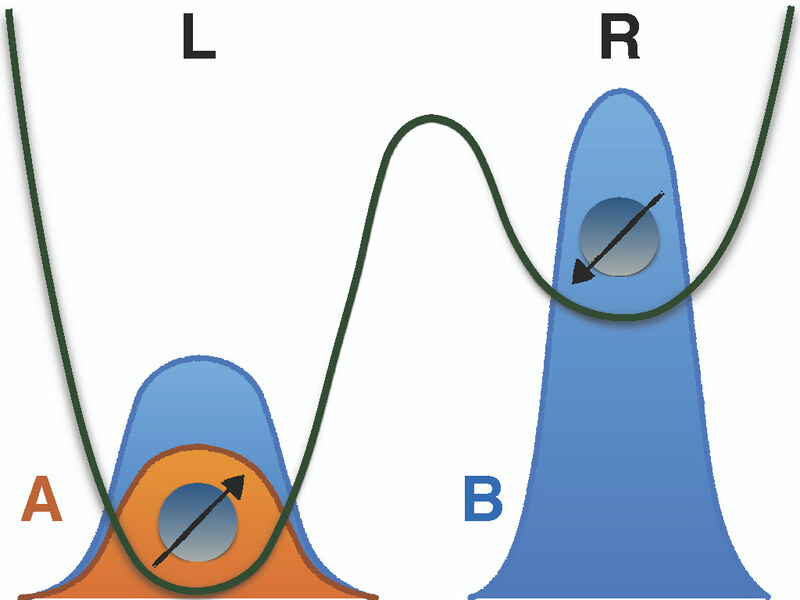 One particle has a localized (orange) wave function A in the left well L, while one particle has a (blue) wave function B which overlaps with A, being nonzero in both the left well L and the right well R. This is a typical instance where one particle can tunnel from a site to the other one and indistinguishability counts. This aspect comes from a natural requirement known as cluster decomposition principle stating that distant experiments are not influenced by each other . Otherwise, quantum indistinguishability comes into play when the constituting particles are close enough to spatially overlap. This happens for all the applications of quantum information processing based, for instance, on quantum dot technology with electrons [7,8] or on Bose-Einstein condensates [9,10], where the particles have the possibility to tunnel from a location to the other (Fig. 1). Hence, correctly treating identical particle entanglement, besides its fundamental interest, is a central requirement in quantum information theory. Despite this, the analysis of identical particle entanglement has been suffering both conceptual and technical pitfalls [2-4]. The ordinary approach to deal with identical particles in quantum mechanics textbooks consists in assigning them unobservable labels which give rise to a new fictitious system of distinguishable particles . In order that this new system behaves as the original (bosonic or fermionic) one, only symmetrized or anti-symmetrized states with respect to labels are allowed. The byproduct is that, according to the usual notion of non-separability employed in quantum information theory to define entanglement, such states entangled. Ordinary entanglement measures, such as the von Neumann entropy of the reduced state obtained by partial trace, fail then to be directly applied to these states. In particular, they witness entanglement even for independent separated particles which are clearly uncorrelated and also show contradictory results for bosons and fermions . As a consequence, methods utilizing notions at variance with the ordinary ones adopted for distinguishable particles have been formulated to overcome this issue [3,4]. In any case, these alternative methods remain technically awkward and unsuited to quantify entanglement under general conditions of scalability and wave function overlap. The use of new notions to discuss quantum entanglement for identical particles looks surprising, not less than the introduction of unobservable labels which is in contrast with the quantum mechanical requirement that the state of any physical system is uni-vocally described by a complete set of commuting observables. So far, there has not been general agreement even whether the entanglement between two identical particles in the same site may exist [3, 11, 12]. The characterization of quantum entanglement for identical particles has thus remained problematic, jeopardizing the general understanding and exploitation of composite systems. 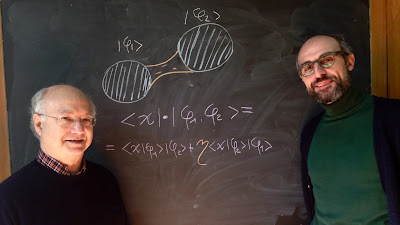 In our recent work , we provide a straightforward description of entanglement in systems of identical particles, based on simple physical concepts, which unambiguously answers the general question: when and at which degree the identity of quantum particles plays a physical role in determining the entanglement among the particles? This is achieved by introducing a novel approach for identical particles without resorting to fictitious labels, differently from the usual textbook practice. The core of this approach is that the state of several identical particles must be considered a whole entity while the transition probability amplitude between two of such states is expressible in terms of single-particle amplitudes by applying the basic quantum-mechanical superposition principle with no which-way information to alternative paths. Our approach enables the determination of entanglement for both bosons and fermions by the same notions usually adopted in entanglement theory for distinguishable particles, such as the von Neumann entropy of the reduced state. The latter is obtained through the partial trace defined by local single-particle measurements. 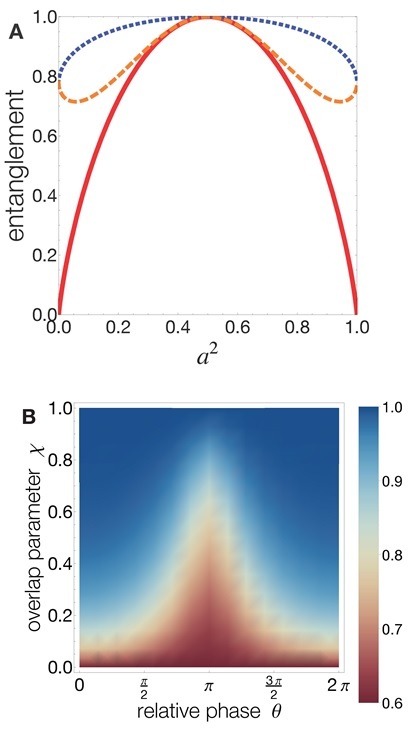 Figure 2: Panel A. Entanglement as a function of system parameters for a fixed degree of spatial overlap for bosons (blue dotted line) and fermions (orange dashed line), compared to the corresponding entanglement of nonidentical particles (red solid line). Panel B. Density plot of bosonic entanglement as a function of both relative phase in the system state and degree of spatial overlap. We have analyzed a system of two identical qubits (two-level systems) with orthogonal internal states (opposite pseudospins). The qubits are supposed to have wave functions (spatial modes) which can overlap at an arbitrary extent. A simple system which realizes this condition is that of the asymmetric double-well configuration illustrated in Fig. 1. 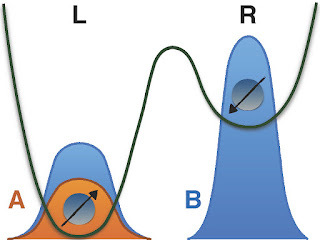 When the two particles partially overlap in a spatial region where local single-particle measurements can be done, entanglement depends on their overlap and an ordering emerges for different particle types, fermions or bosons (Fig. 2). Moreover, identical particles are found to be at least as entangled as non-identical ones placed in the same quantum state. This result suggests that identical particles may be more efficient than distinguishable ones for entanglement-based quantum information tasks. The main findings of this analysis can be summarized as: (i) an absolute degree of entanglement for identical particles, independent of local measurements, can be assigned only when the particles are spatially separated or in the same site; (ii) the act of bringing identical particles into overlapping spatial modes creates an “entangling gate” whose effectiveness depends on the amount of overlap. Our results finally show that a natural creation of maximally entangled states is possible just by moving two identical particles with opposing pseudospin states into the same site, supplying theoretical support to recent observations in an experiment with ultracold atoms transported in an optical tweezer . This gives a definitive positive answer whether identical particles in the same site can be entangled. Our approach contributes, from a fundamental point of view, to clarify the relation between quantum entanglement and identity of particles. It remarkably allows the quantitative study of entanglement under completely general conditions of overlap and scalability, motivating studies on correlations other than entanglement  in the context of identical particle systems. Moreover, our study paves the way to interpret experiments which use quantum correlations in relevant scenarios where identical particles can overlap. Luigi Amico, Rosario Fazio, Andreas Osterloh, Vlatko Vedral, “Entanglement in many-body systems”, Review of Modern Physics, 80, 517 (2008). Abstract. Malte C. Tichy, Florian Mintert, Andreas Buchleitner, “Essential entanglement for atomic and molecular physics”, Journal of Physics B: Atomic, Molecular and Optical Physics, 44, 192001 (2011). Full Text. F. Benatti, R. Floreanini, K. Titimbo, “Entanglement of identical particles”, Open Systems & Information Dynamics, 21, 1440003 (2014). Abstract. Claude Cohen-Tannoudji, Bernard Diu, Franck Laloë, “Quantum mechanics. Vol. 2” (Willey-VCH, Paris, France, 2005). Asher Peres, “Quantum Theory: Concepts and Methods” (Kluwer Academic,1995). Michael H. Kolodrubetz, Jason R. Petta, “Coherent holes in a semiconductor quantum dot”, Science 325, 42 (2009). Abstract. Z.B. Tan, D. Cox, T. Nieminen, P. Lähteenmäki, D. Golubev, G.B. Lesovik, P.J. Hakonen, “Cooper pair splitting by means of graphene quantum dots”, Physical Review Letters, 114, 096602 (2015). Abstract. Marco Anderlini, Patricia J. Lee, Benjamin L. Brown, Jennifer Sebby-Strabley, William D. Phillips, J.V. Porto, “Controlled ex-change interaction between pairs of neutral atoms in an optical lattice”, Nature, 448, 452 (2007). Abstract. GianCarlo Ghirardi, Luca Marinatto, Tullio Weber, “Entanglement and properties of composite quantum sys-tems: a conceptual and mathematical analysis”, Journal of Statistical Physics, 108, 49 (2002). Abstract. Rosario Lo Franco, Giuseppe Compagno, “Quantum entanglement of identical particles by standard information-theoretic notions”, Scientific Reports, 6, 20603 (2016). Full Text. A.M. Kaufman, B.J. Lester, M. Foss-Feig, M.L. Wall, A.M. Rey, C.A. Regal, “Entangling two transportable neutral atoms via local spin exchange”, Nature 527, 208 (2015). Abstract. Kavan Modi, Aharon Brodutch, Hugo Cable, Tomasz Paterek, Vlatko Vedral, “The classical-quantum boundary for corre-lations: Discord and related measures”, Review of Modern Physics, 84, 1655 (2012). Abstract.